The music didn't really die on Feb. 3, 1959, the day a four-seat airplane carrying Buddy Holly, Ritchie Valens and The Big Bopper (J.P. Richardson) crashed into a cornfield eight miles north of Clear Lake, Iowa. Five years and six days later, the Beatles, who learned their craft from Buddy Holly records and whose name is a shoutout to Holly's Crickets, played the Ed Sullivan show. No, the music lived. It just got bigger than anyone in 1959 could have imagined. Still, that plane crash deeply affected a rock 'n' roll world that in 1959 was still in early adolescence. The term "rock 'n' roll" itself had only come into widespread use about three years earlier, though it had floated around the blues world at least since the 1920s as a thinly camouflaged synonym for fun under the sheets. When you're young, you don't think about death. 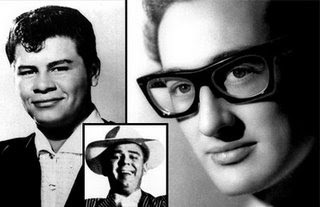 Feb. 3, 2009 is the 50th anniversary of the day musicians Ritchie Valens, Buddy Holly and the Big Bopper were killed in a plane crash. Before Feb. 3, 1959, rock 'n' roll's idea of a loss was Elvis Presley going into the Army or Little Richard announcing he was going to sing only for he Lord. John Lennon later would remarks that rock 'n' roll died when Elvis went into the Army. On this one, John was wrong. There's a widespread popular myth that after Elvis' induction and the Buddy Holly plane crash, the enemies of rock 'n' roll smashed it into harmless little pieces. By this myth, traditionalists in the music, entertainment and radio games got together and conspired to replace the wild, raw power of Elvis, Buddy and Little Richard with the harmless likes of Fabian and Frankie Avalon, pretty boys with minimal talent. Thus yanking the teeth and the bite out of this dangerous, subversive intruder. Without question there were traditionalists who wanted to see that happen, and even many fans believed rock 'n' roll was another fad, like goldfish swallowing, whose inevitable expiration date was coming up fast. They too were wrong. The music and the seeds it planted in those 1958-1964 years, between Elvis and the Beatles, will stand with any six years in rock 'n' roll history. Motown started then, with artists like Marvin Gaye, Smokey Robinson and the Temptations. That was Roy Orbison's peak. You had the Beach Boys and the Four Seasons at their best. Phil Spector was producing, Stax and Muscle Shoals were gearing up. The Shirelles were singing. So were Del Shannon and Arthur Alexander and James Brown and Gene Pitney. Small companies produced hundreds of great singles, from Maxine Brown's "All In My Mind" to Kathy Young's "A Thousand Stars" to the Capris' classic "There's a Moon Out Tonight" and the Edsels' immortal "Rama-Lama-Ding-Dong."